Southern Purple Spotted Gudgeons occur in inland drainages of the Murray-Darling basin as well as coastal drainages of northern NSW and Queensland. 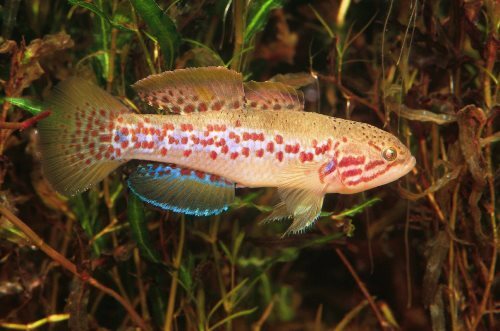 The western population of the Southern Purple Spotted Gudgeon was previously widespread in the Murray, Murrumbidgee and Lachlan River systems and tributaries of the Darling, but has experienced a significant decline in recent times. Southern Purple Spotted Gudgeons are now extremely rare in inland NSW, having been recorded from this area only once since 1983. Southern Purple Spotted Gudgeons generally grow to 15 cm in length. Southern Purple Spotted Gudgeons are small and robust with a rounded head, a relatively small mouth and a rounded tail. They are generally dark chocolate in colour along the back, fading to pale fawn on the belly, with a number of distinguishing markings. These include black to grey patches on the sides, which are surrounded by numerous white and red spots that brighten during breeding. The fins are yellow in colour, darkening towards the extremities.